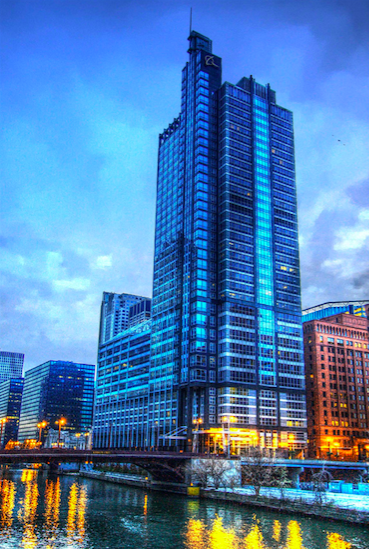 The Boeing Building (100 North Riverside Plaza) is an enormous facility that offers ample room for your next office space. This building offers amenities that include: a restaurant, concierge services, a large conference center and more. The Boeing Building is also in an ideal location, as it is located on the riverfront. The Boeing Building is the international headquarters for Boeing, and has formerly been the host of companies such as Morton Salt and Ameritech. This 36-floor skyscraper was completed in 1990, and it won the Structural Engineers Association of Illinois’ “Most Innovative” Design Award. Boeing Building also prides itself on being a green building, and has a LEED Gold U.S. Green Building Council certification. Office spaces are available if you are looking to move your business into one of the best buildings in Chicago’s West Loop. Make sure to give the Boeing Building a look to see if it is the right choice for your business. Booking Howl2GO Dueling Pianos’ world class show to your Chicago, IL event couldn’t be simpler. From conventions to corporate events, weddings to fundraisers, our unbeatable Dueling Piano shows bring a high energy, interactive show that your guests will remember for years to come anywhere in Illinois!